Samples on your first Box. 25% off Harry Josh Flat Iron. your favorite skincare & beauty brands. 10% Off Almost Everything + Free Samples + Free Shipping Details: Get 10% Off Your Purchase. Plus, Get Free Samples & Free Shipping With Your Order. Excludes some brands including Dermalogica, Clarisonic, Perricone MD, Skinceuticals, & Jane Iredale. Exclusions: Unless otherwise stated the following brands will not be participating in any promotion: Dermalogica, Jan Marini, Epionce, PCA Skin, Alterna, DermaQuest, CellCeuticals, NuFACE, Clarisonic, Societe Clinical Skincare, blush Mystery Beauty Box, Beautyfix Boutique products and all gift cards. Free return shipping restricted to exchanges and store credits. Enroll in automatic refills and get your 5th product FREE! Also enjoy FREE 1-3 day shipping + gift on all orders all the time! Some brands not included. New customers only. Sign up for newsletter and get $10 off your first order of $50 or more. 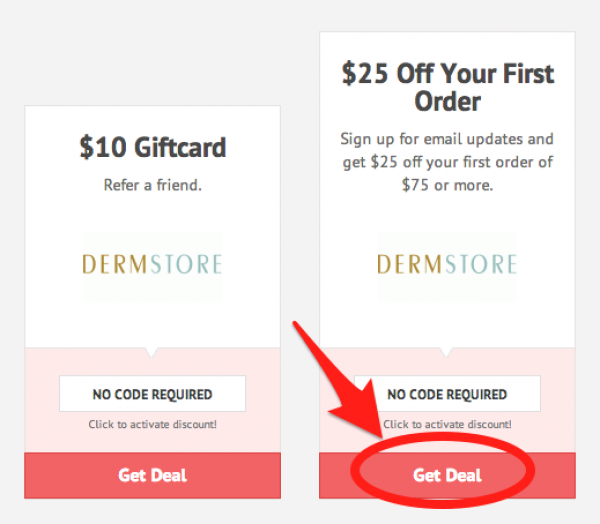 Save an average of $8 with Dermstore coupon codes. Get all of your beauty and skincare products at a discount without having to visit the dermatologist. Some say beauty is only skin deep. Others see beauty as an outer expression of inner qualities. But what everyone agrees is that healthy skin lets your beauty radiate from inside out. Find everything you need to keep your skin glowing with health at DermStore.com. Did you know that your skin is the largest organ in your body? That’s just one more reason to keep it healthy. At DermStore, you can shop for skin products depending on your skin type, and find brands like Dermalogica, Avene, Murad, Dr Brandt, Obagi, Jane Iredale, and many more. DermStore’s eye creams, facial cleansers, sunscreens, exfoliants, and other products will have your skin looking radiant, no matter your age or skin type. If you’re having skin issues, check out the doctor-recommended treatments here including acne, cellulite, and rosacea treatments. Worried about what, exactly, you’re putting on your skin? Take a look at the Natural and Organic store, where you’ll find certified all-natural skincare and beauty products. Not only do these products only use natural ingredients, they are also certified vegan and cruelty-free. Do something kind for the planet and for your skin by shopping DermStore’s Natural and Organic collection of lotions, creams, cleansers, and makeup. Just before the new millenium, DermStore was launched in 1999 with the idea to provide dermatologist-recommended products conveniently and affordably. Since then, the store has expanded to include over 700 different brands and over 20,000 individual products. DermStore specializes in providing specialty skincare products and physician-strength products that are usually only available through a doctor’s office. They even have licensed estheticians on staff, whom you can ask any skincare questions you may have. Skip the pricey trip to the dermatologist, and just head a few clicks away to DermStore.com. Get your glow on with spa- and physician-quality skincare products, and slather on the savings by using a DermStore coupon code. DermStore has every product you need to get that glowing skin you’ve always wanted. Whether you want to get rid of fine lines or tackle your acne, DermStore has items that will have you feeling beautiful and confident. With your DermStore coupon code, you’ll be saving money while looking gorgeous. Here are some questions you might come up with while searching the site. Why isn’t my DermStore coupon code working? You’ve found the perfect products for your skin type, but you found that your DermStore coupon code isn’t working. No problem: just check to make sure there aren’t any special restrictions attached to that specific deal. Sometimes expiration dates or minimum size orders can keep your DermStore coupon code from being applied. To contact a representative for DermStore, you can call 1-800-213-3376, 24 hours a day, 7 days a week. You can also email them at service@dermstore.com. DermStore currently offers free shipping! For orders expected to arrive within 7-10 days, shipping is absolutely free. Sometimes DermStore offers additional promotions, like free shipping on 1-3 Day orders, so check the site before you place your order. For more details, visit the Shipping Policy page. What is the return policy at DermStore? DermStore has a Money-Back Guarantee for all purchases. If for any reason you’re unhappy with the products, you have 30 days to return them for a full refund. DermStore also includes free return shipping. For more information about how to send back items, go to Returns. DermStore currently accepts Visa, American Express, MasterCard, and PayPal. How do I get a free gift with purchase? You can receive tons of free gifts when you shop at DermStore. They usually offer a different Gift of the Day, so you’ll never know what fun bonus you’ll get next. For products you can receive with a purchase, go to the Gift Products page. Ready to make your dreams of smooth, radiant skin a reality? Well, don't pull out your credit card until you make sure you're getting a great deal! Follow these instructions to use a Dermstore coupon code for glowing savings. First, find a Dermstore promo code that you like at CouponPal.com. Then click on "Get Code" or "Get Deal." If you choose a coupon that requires a code, a new window will appear, displaying the code. You should highlight and copy it so that you can use it later. If no code is required, your savings will be automatically applied when you shop. Meanwhile, you'll be redirected to Dermstore.com. Next, shop to your heart's content at the Dermstore website. Don't forget to check out the deal of the week for savings on a different product every week, and take a look at the Beauty Center for beauty tips and tricks. When you're done shopping, click on the shopping bag icon in the upper righthand corner of the page. On your shopping cart page, first check to make sure that everything in your cart is correct. 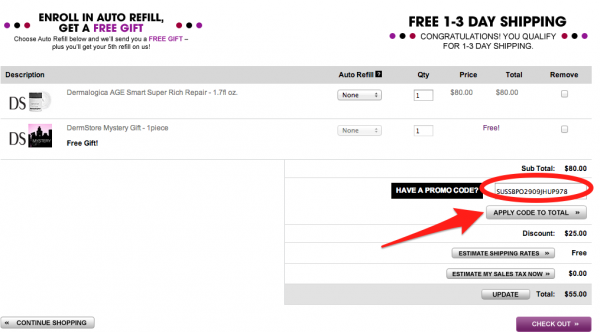 Then scroll to the bottom of the page and find the box that says "Have a Promo Code?" If you picked a coupon that requires a code, paste the code here and click "Apply Code to Total." Your discount should appear. Next, click "Check Out" to continue. Now you'll have to enter your shipping, billing, and payment information. If your order is a gift, you'll have the option to include a gift receipt and a message with it. Next, you'll get a chance to review your order once more. Finally, submit your order.